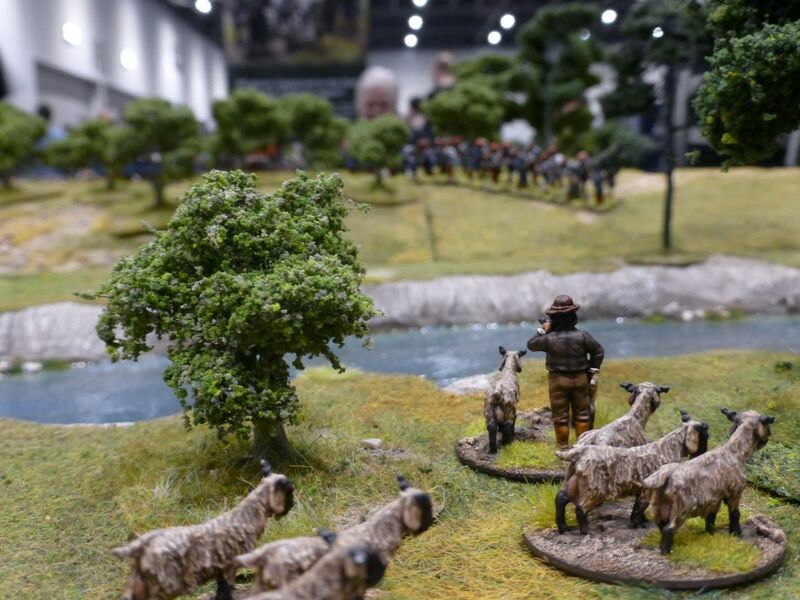 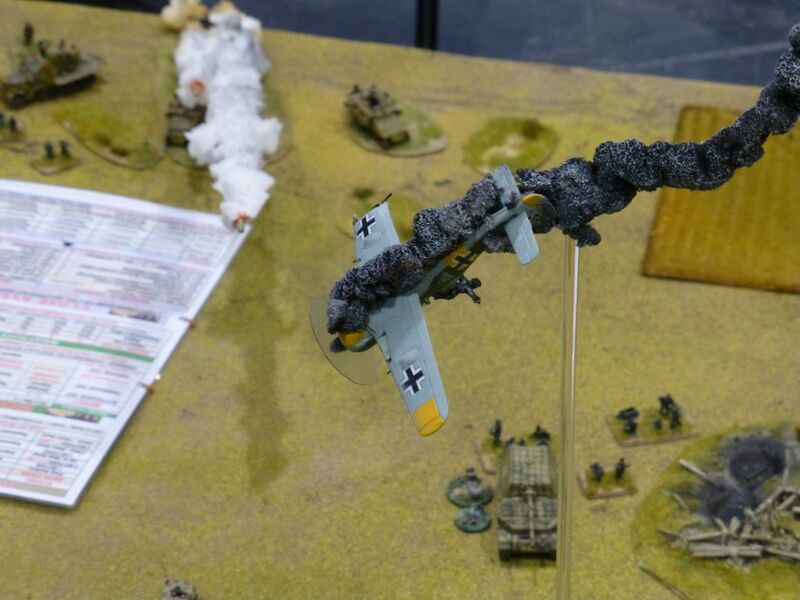 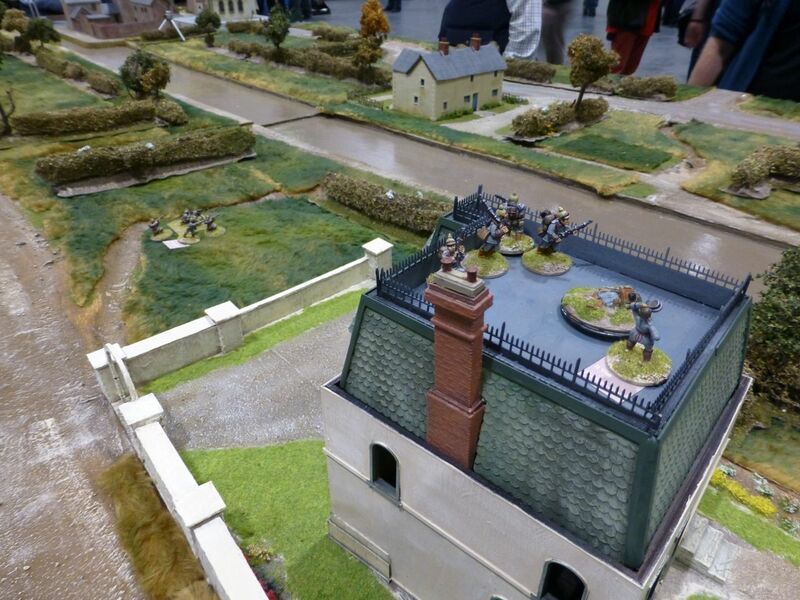 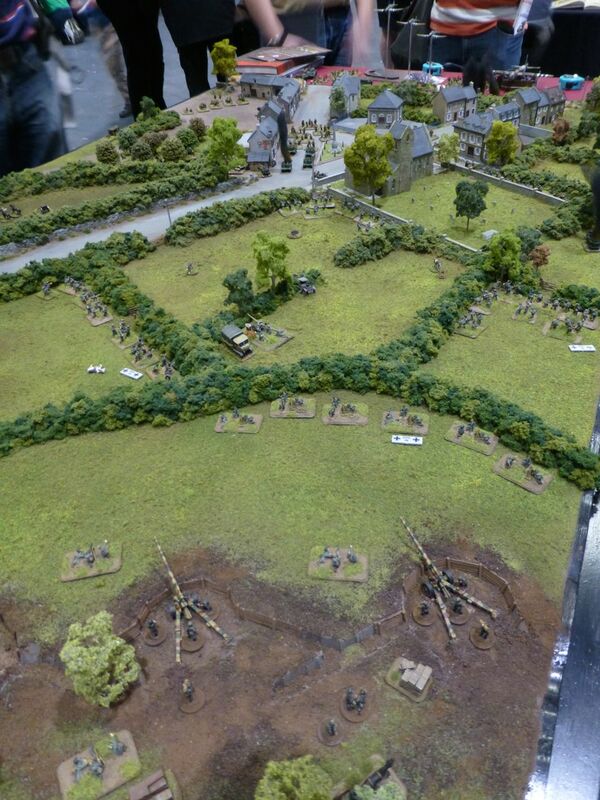 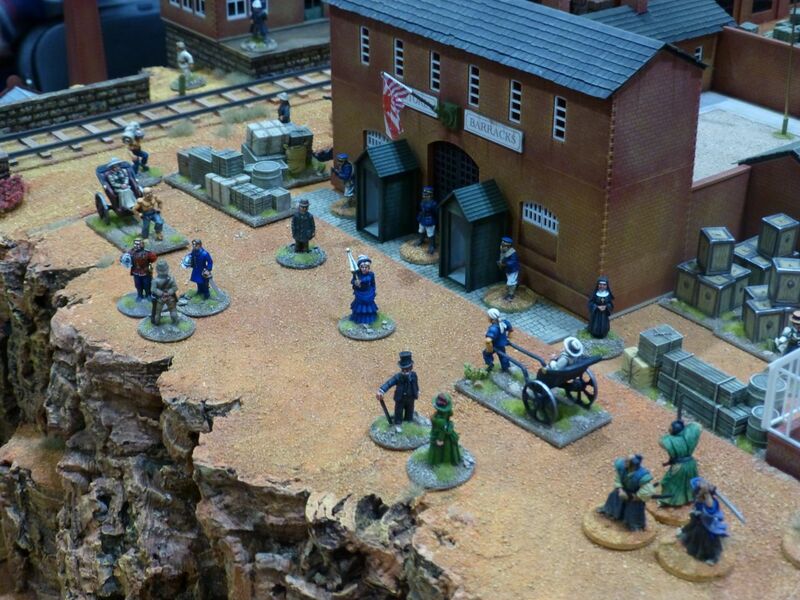 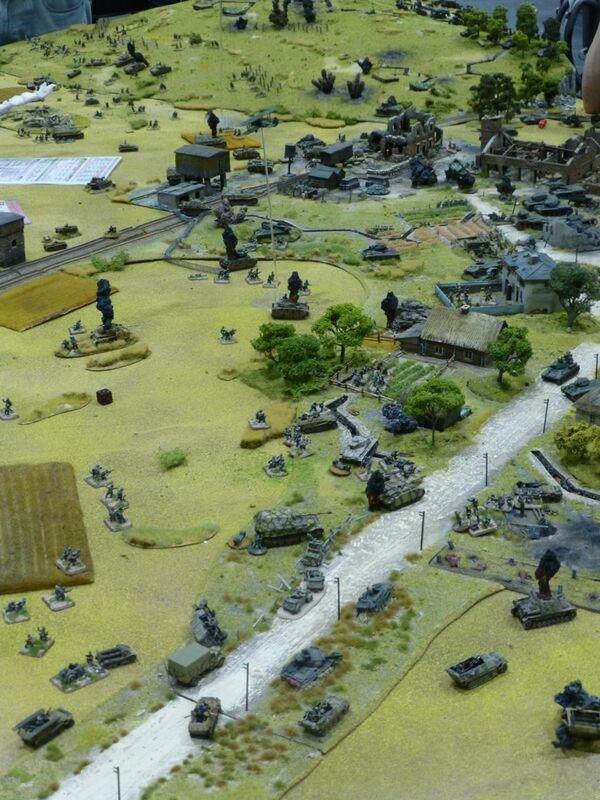 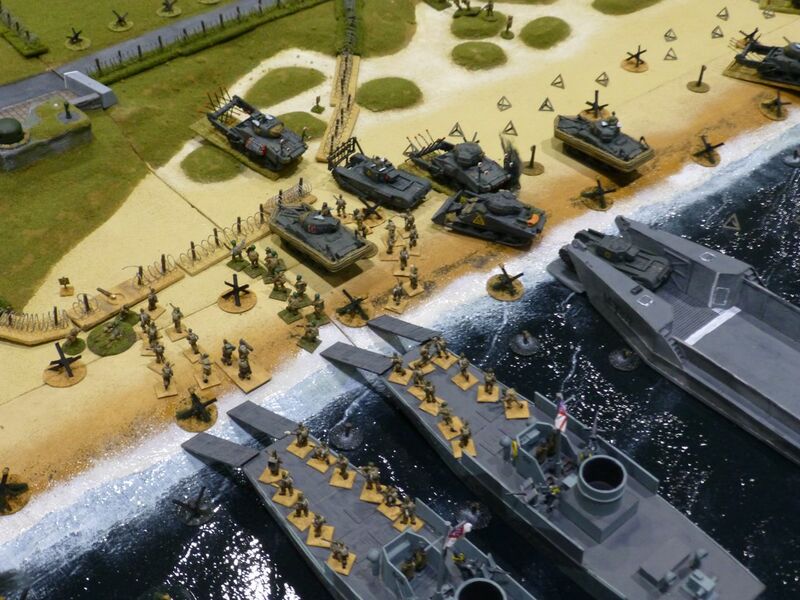 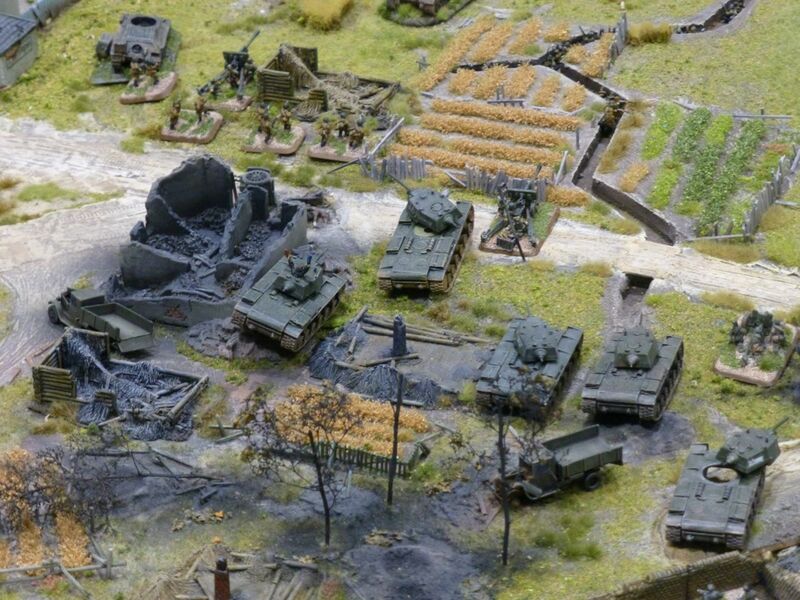 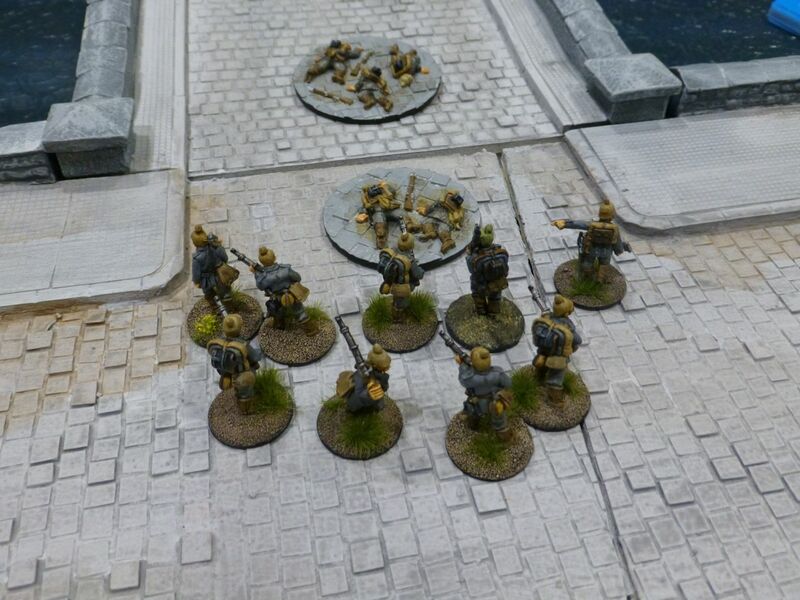 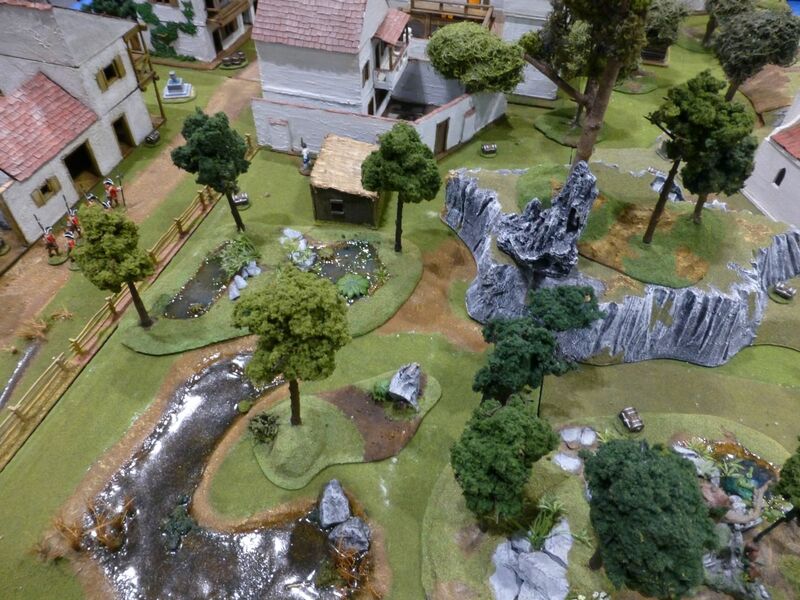 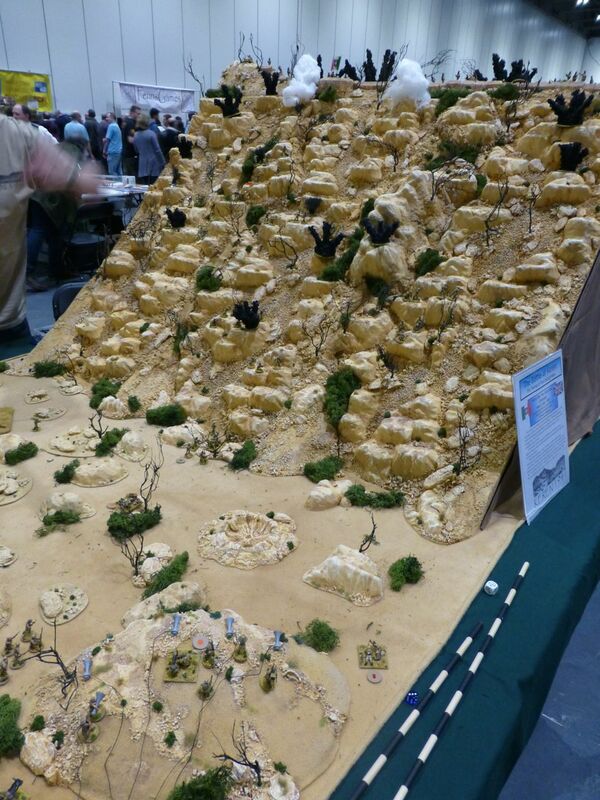 The largest category and the largest boards at Salute 2014 were given over to World War 2. 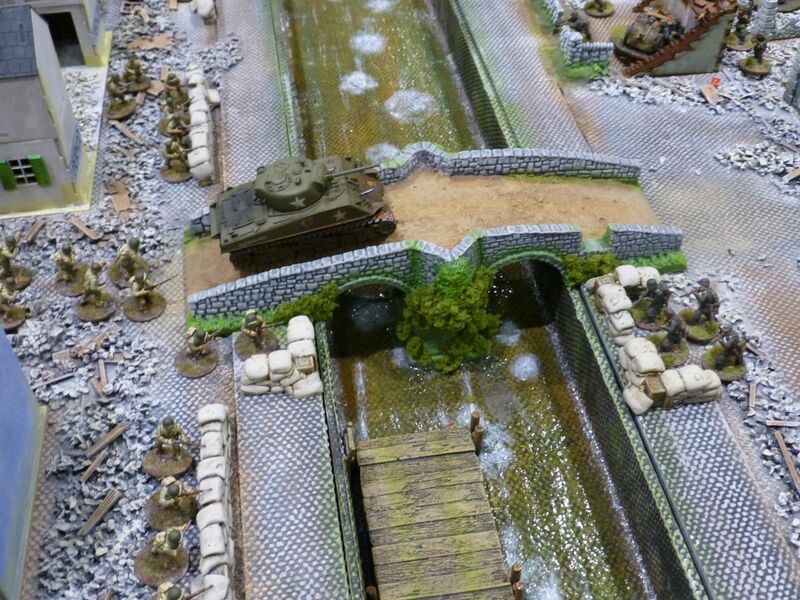 The winner of Best Scenery and the Salute Shield for Best of Show went to Honnington Wargame Group for their D-Day Landing and Marville Battery Assault. 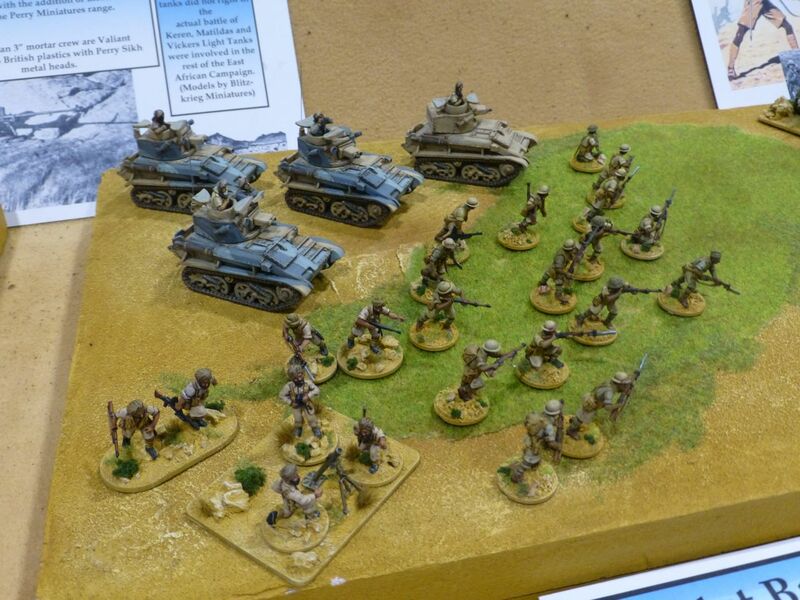 The Newark Irregulars chose an unusual setting with 1941’s Battle of Keren, in which British and Indian troops fought an uphill battle to drive Italian and askari forces from the mountain peaks of Eritrea. 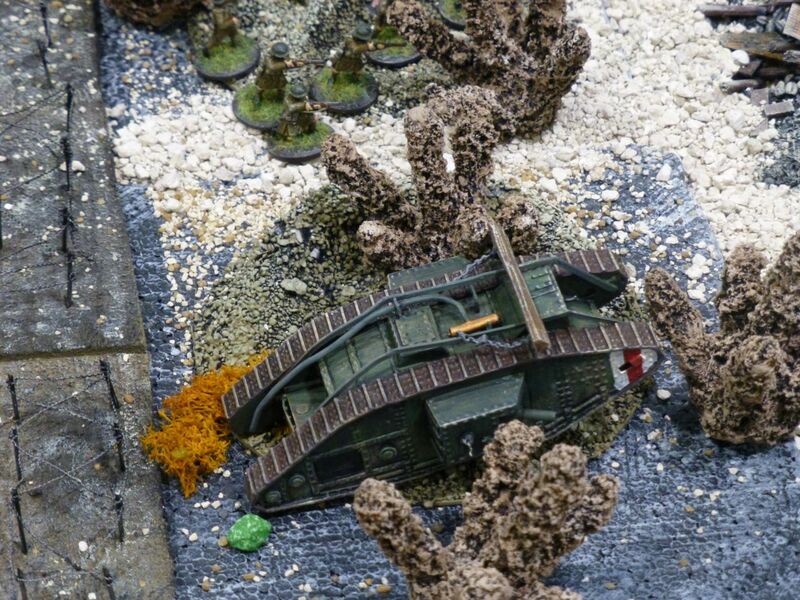 The Salute Challenger award went to Loughton Strike Force and their depiction the Attack on Ponyri during the of the Battle of Kursk in 1943. 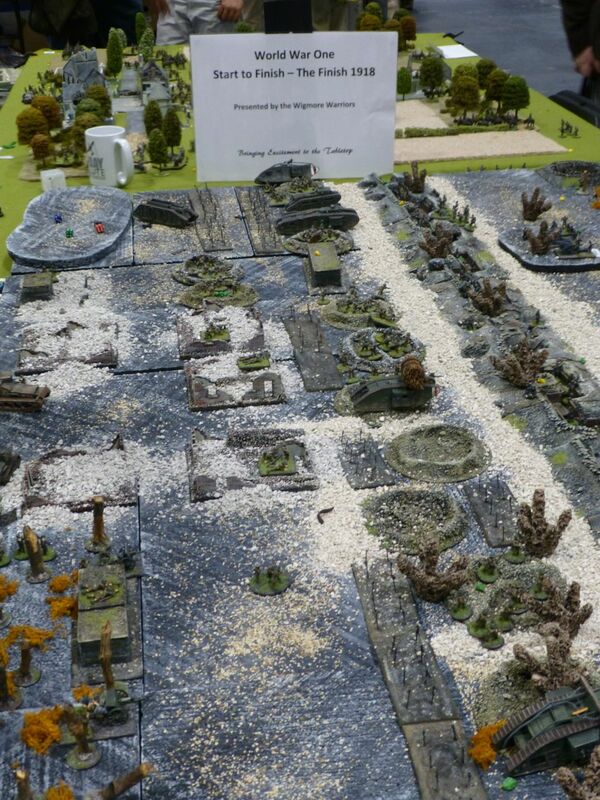 Against my best intentions I didn’t take enough notes to identify the other tables, so these photos have to speak for and by themselves. 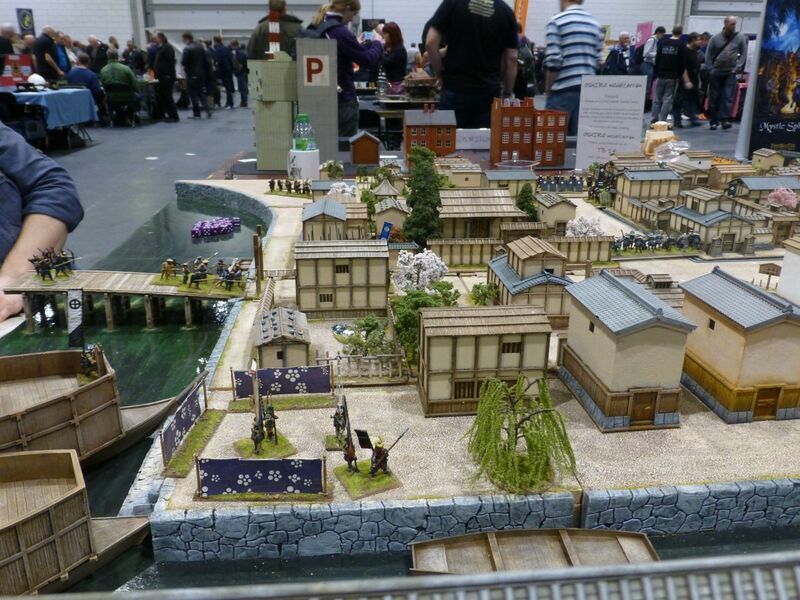 There seems to have been less katana action at Salute 2014 than in previous years. 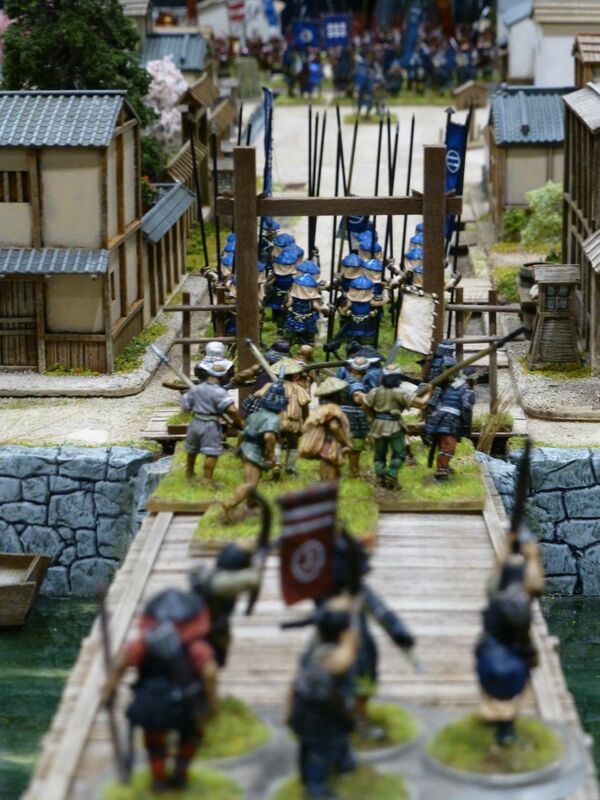 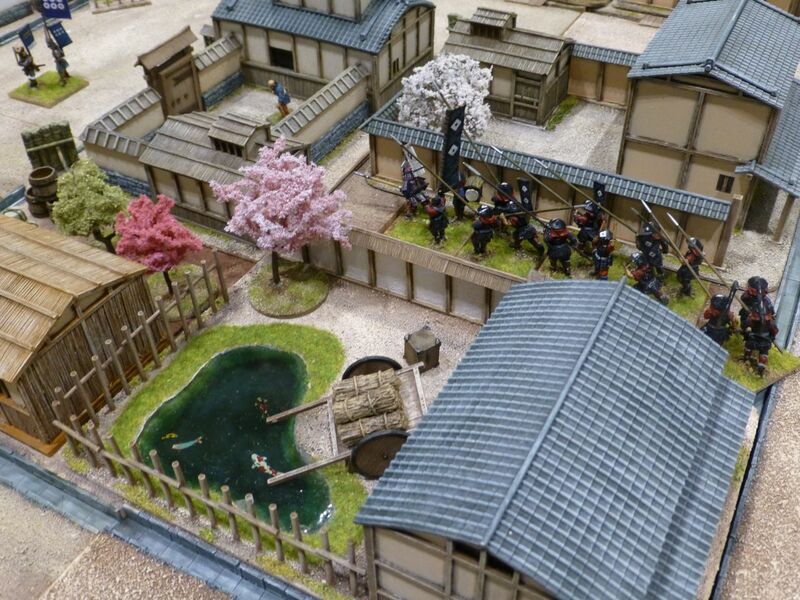 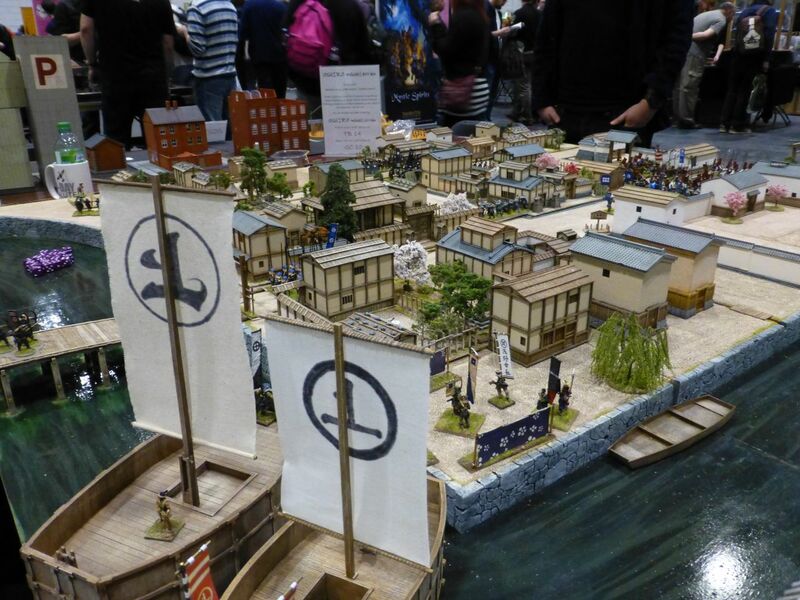 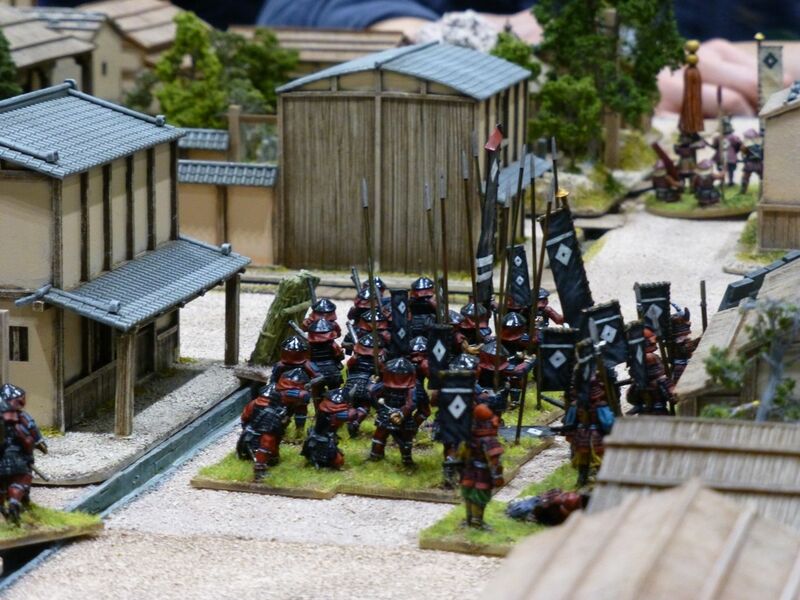 Oshiro Model Terrain however was present once again to fly the samurai banner, and their board was a delight as usual. 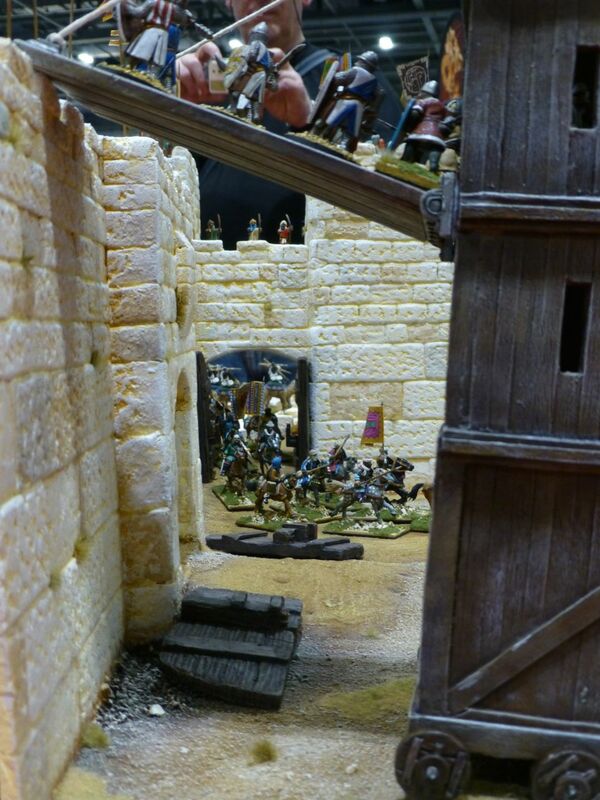 A besieging force has fought its way through a castle town and is now outside the main walls. 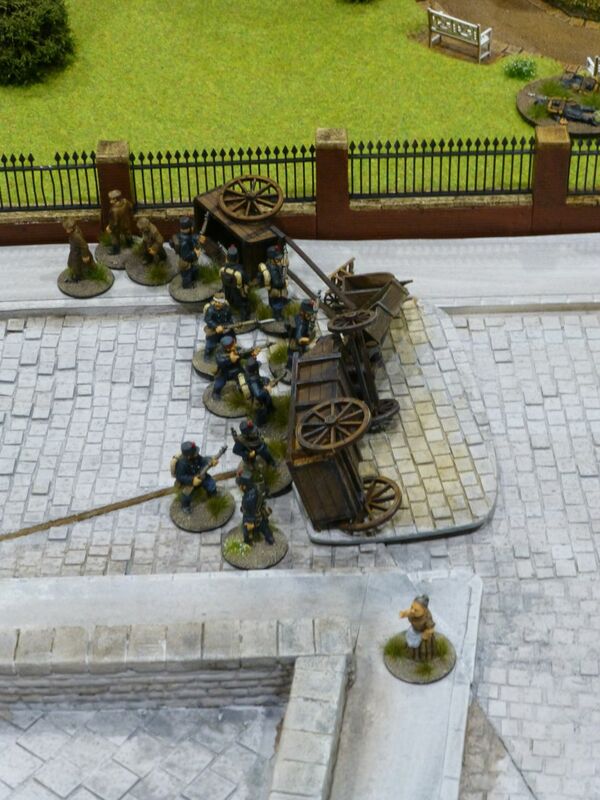 Can the defenders rally out and push them back in bitter street fighting? 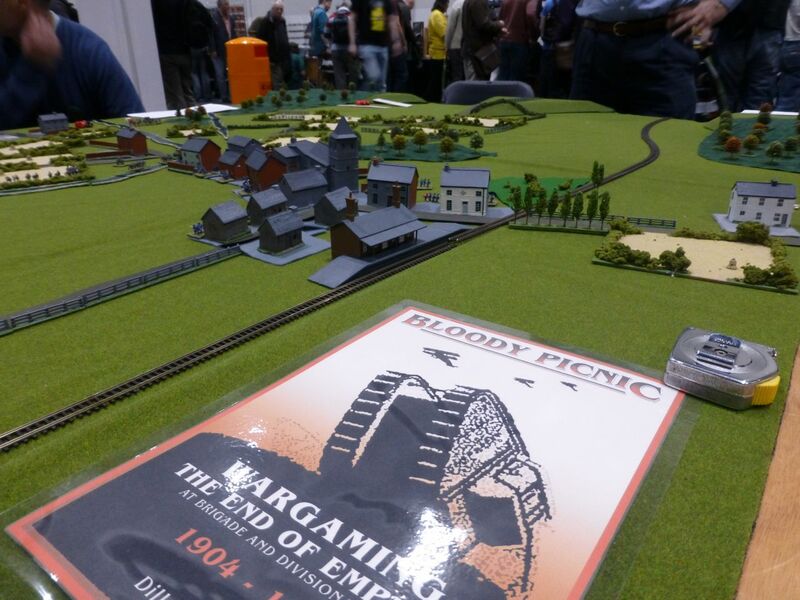 Apart from the classic genres there were also some weird and wonderful participation games at Salute 2014 that defied easy categorisation. 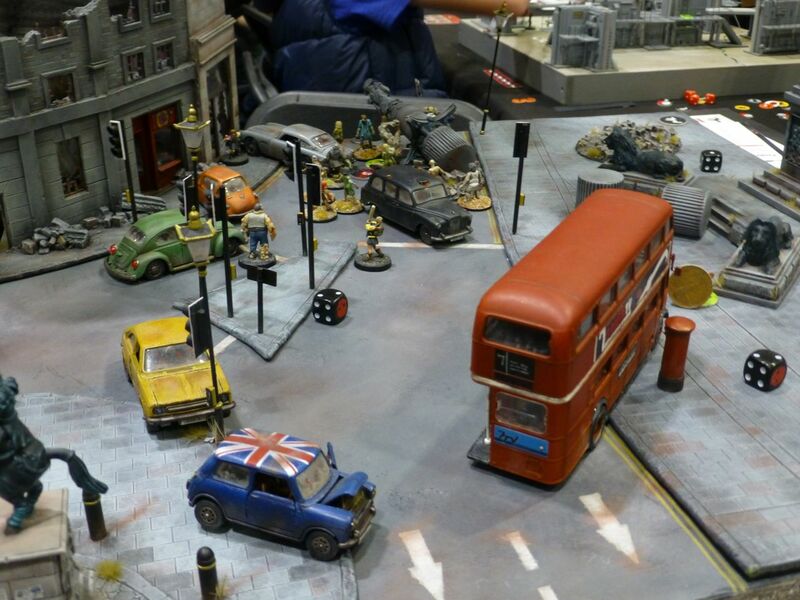 7ombieTV by Crooked Dice was played on a small but characterful board depicting the streets of London. 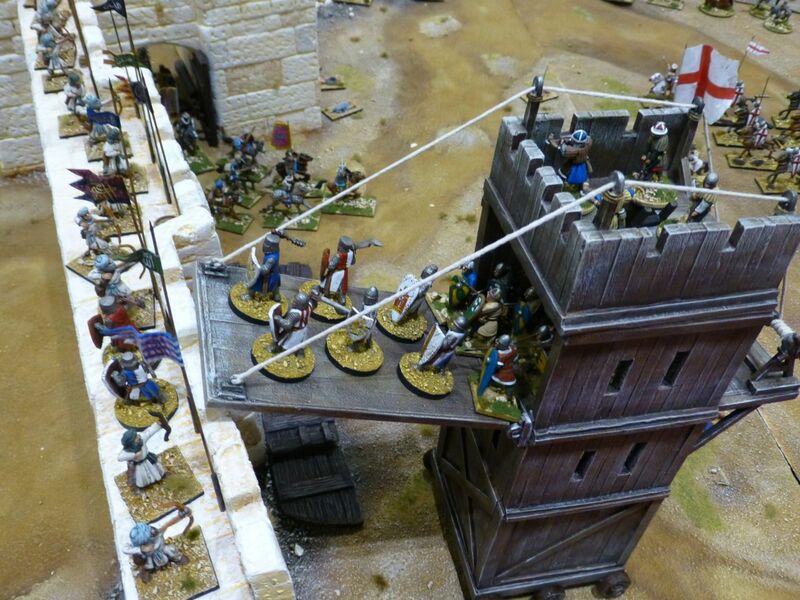 Would the girls of St Searle’s reach the safety of Crooked Towers before the undead horde descended? 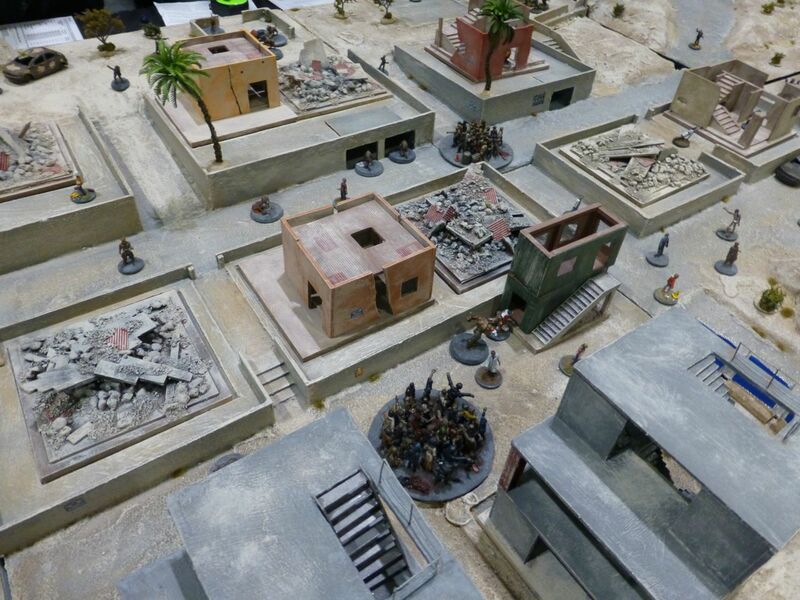 Hasslefree Miniatures created a tribute to Battlefield Bad Company 2 with Zombies roaming the streets of a bombed out desert town. 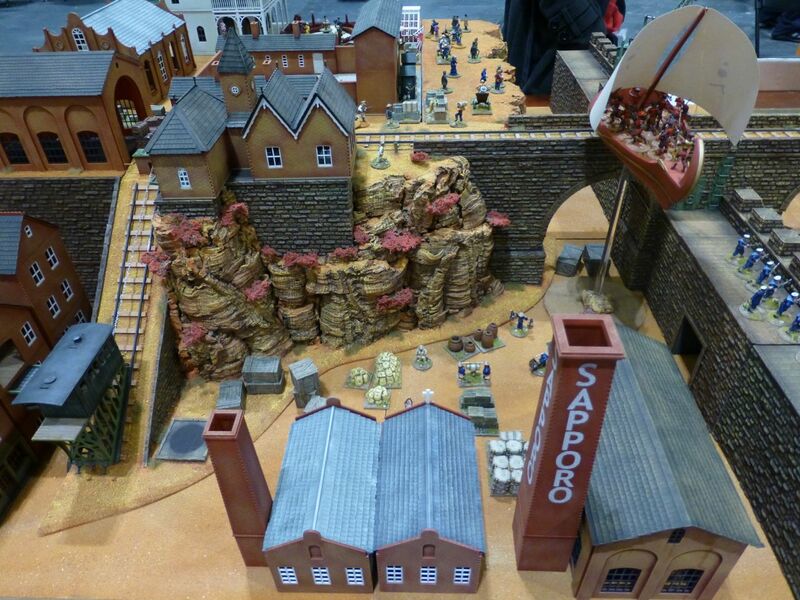 In Her Majesty’s Name was the ruleset used for Dirty Ole Town by Just About Games. 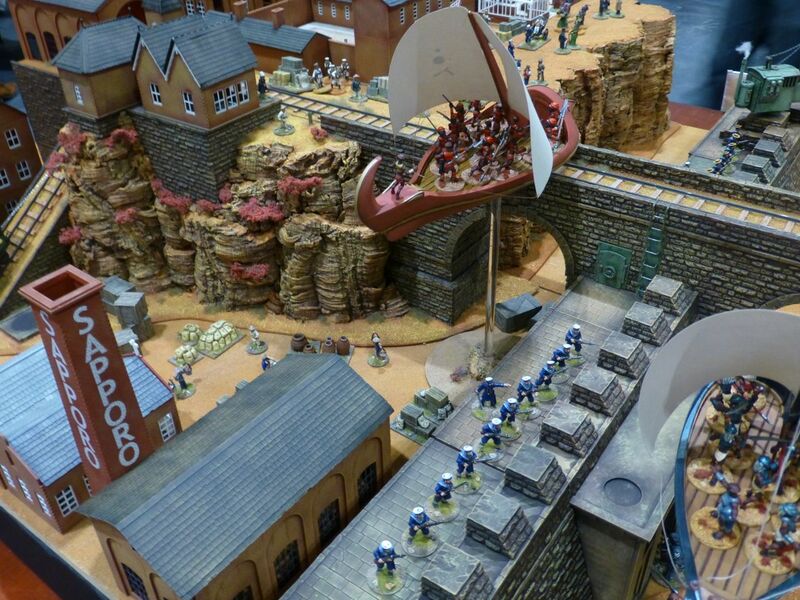 I bought the rulebook published by Osprey a few months ago, just missing such nice terrain to fight over now. 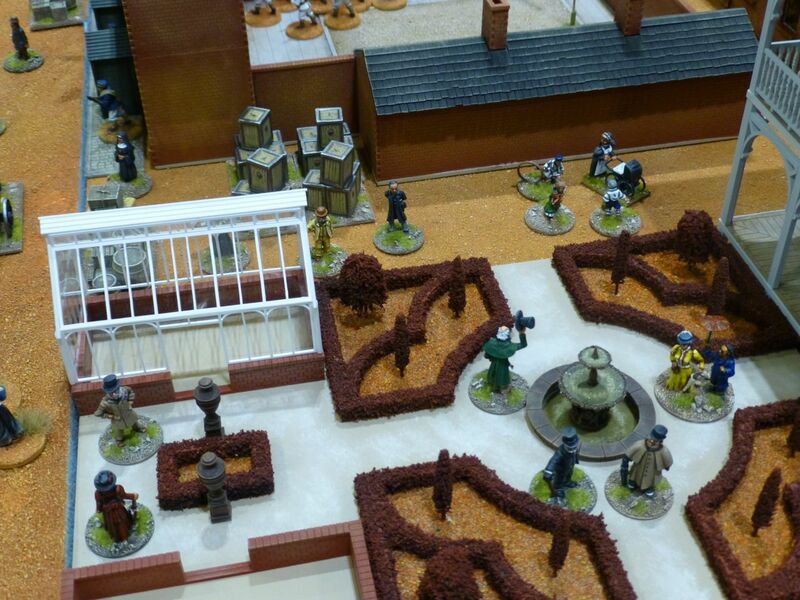 Victorian sci-fi on a grand scale was presented by Red Planet Miniatures in Flight to New Victoria. 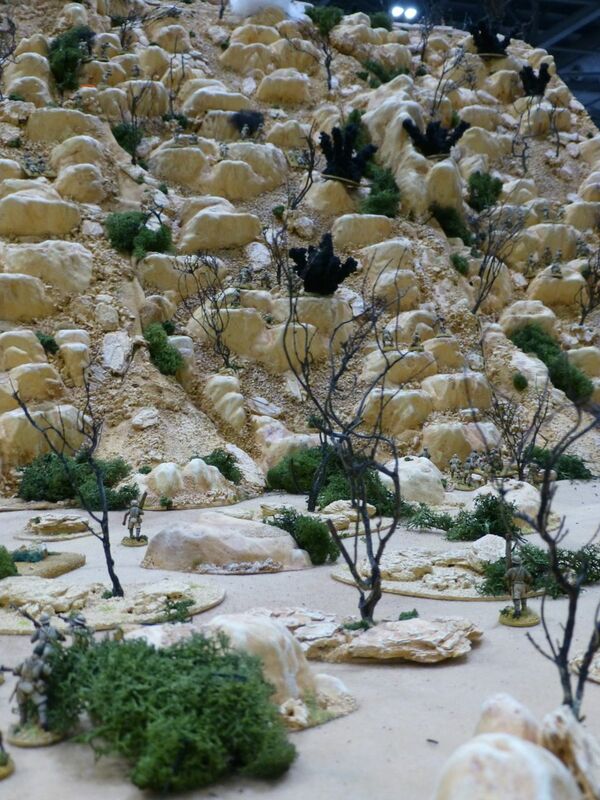 Will the Martian Prince’s convoy reach safety? 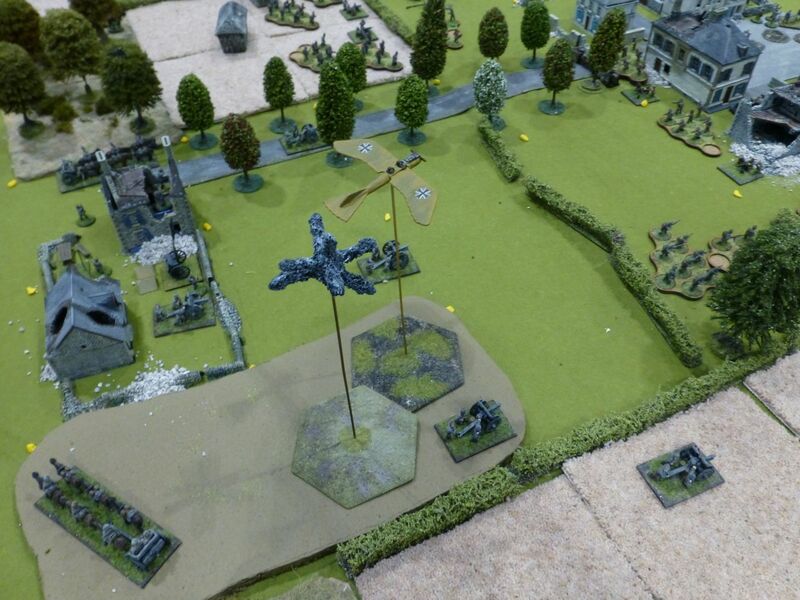 The Essex Warriors played Gear Krieg. 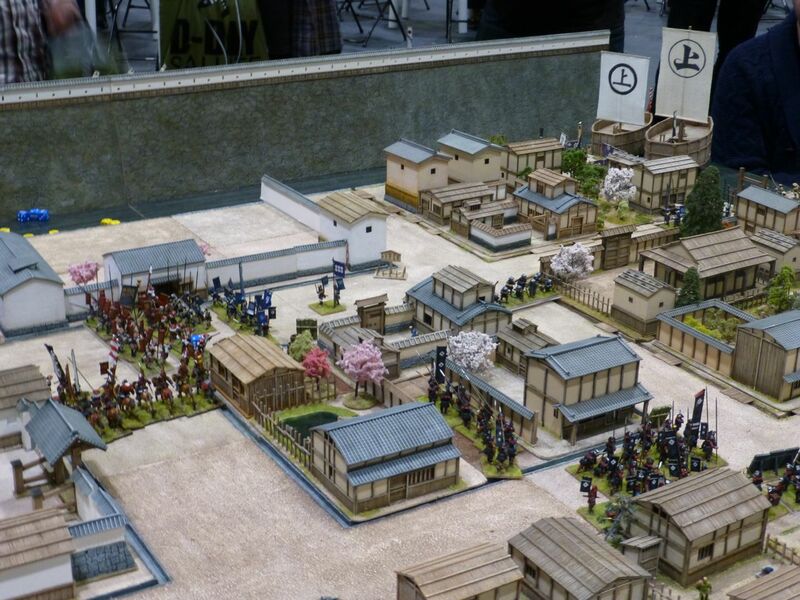 Another one of those rulesets I bought a long time ago but never got around to playing. 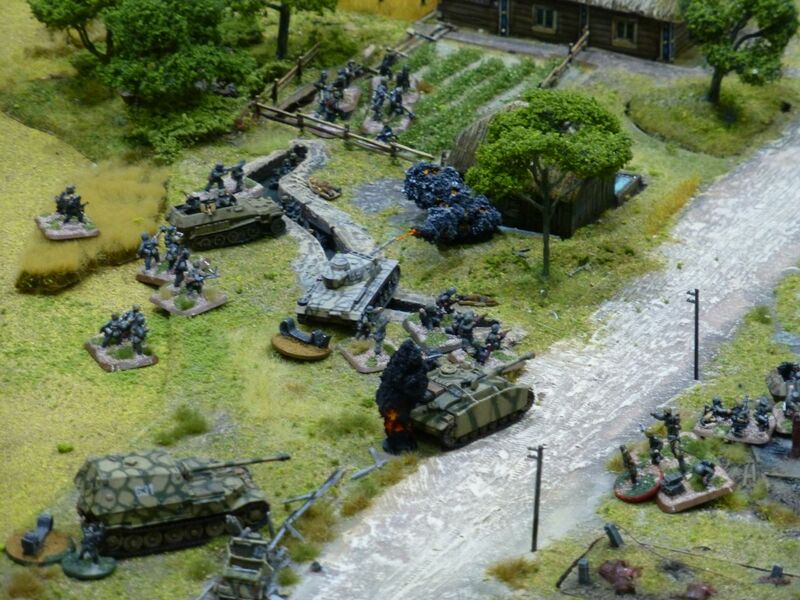 WW2 tanks meeting flying saucers and battle mechs does have its appeal. 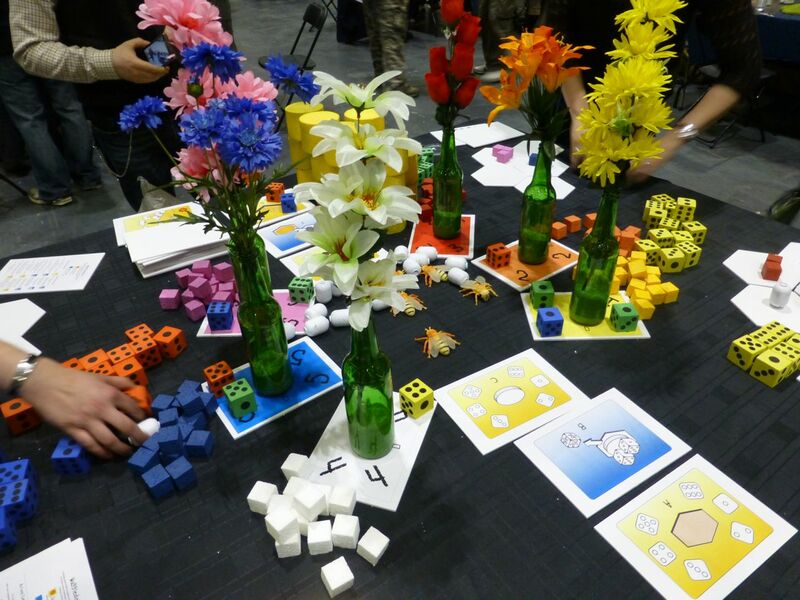 Grublin Games brought a prototype of Waggle Dance, a strategy game of bee-wrangling and honey-making, which will soon launch its funding run on Kickstarter. 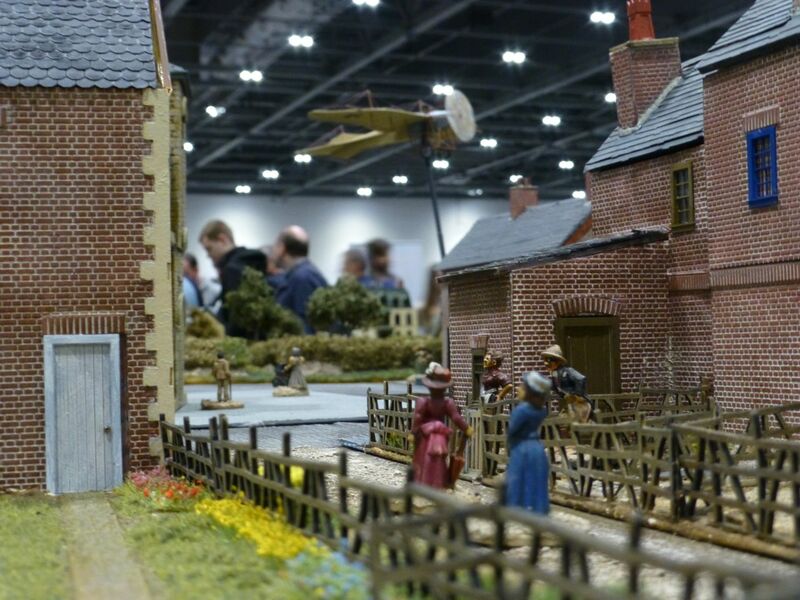 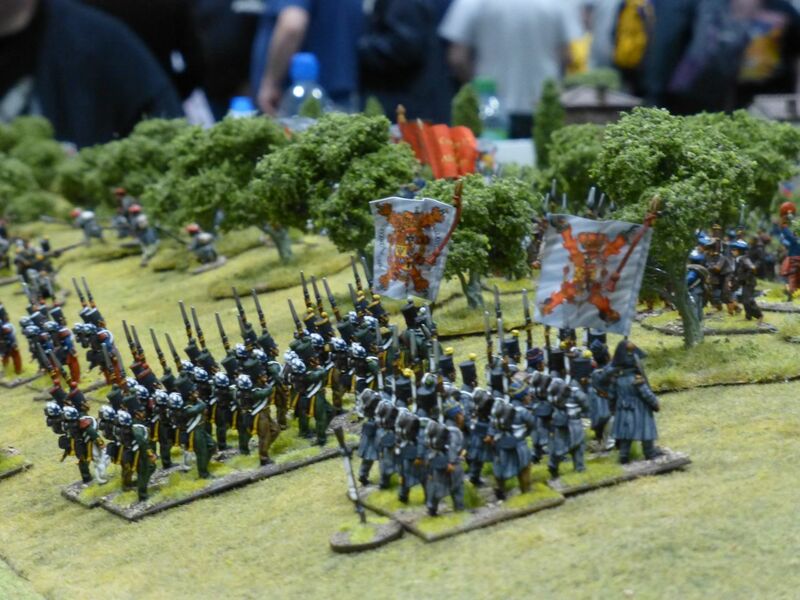 With the centenary of the outbreak of World War 1 this year many of the clubs at Salute 2014 had chosen it as their theme. 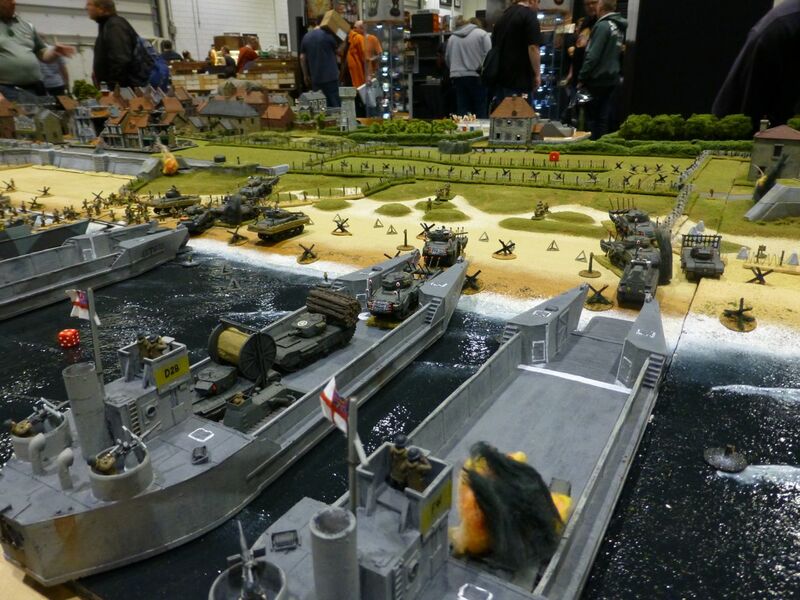 South East Essex Military Society brought a large gaming table and a selection of background materials for their Race for the Sea. 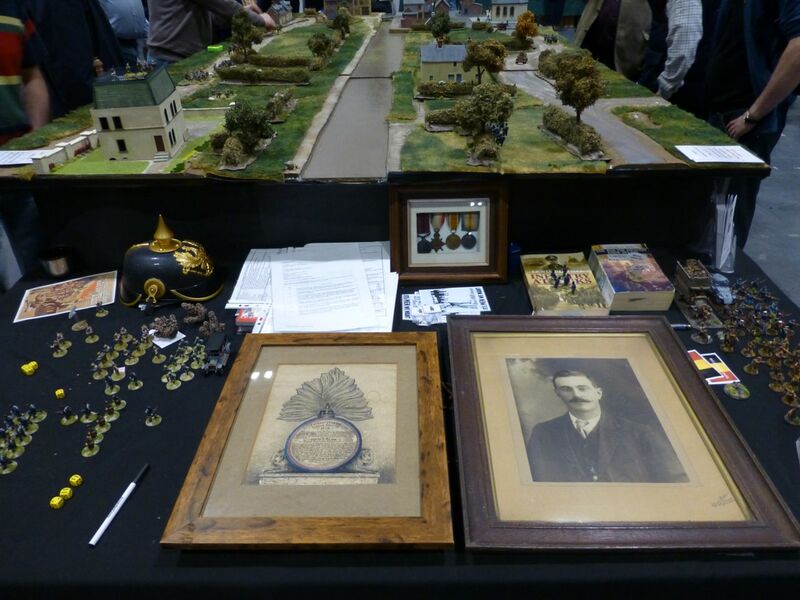 Ypres was the setting for the Wigmore Warriors as they recreated World War 1 – From Start to Finish on two tables showing the same location, one lush green countryside in 1914, the other a bombed out wasteland in 1918. 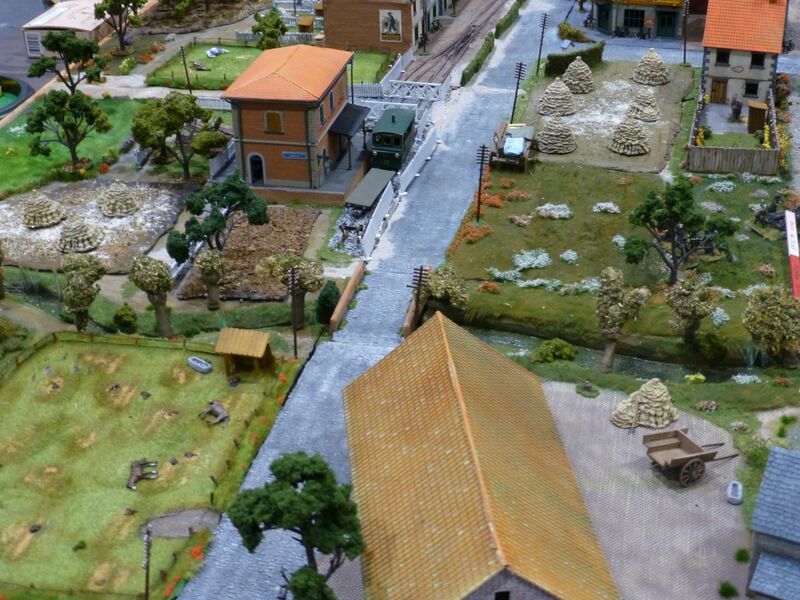 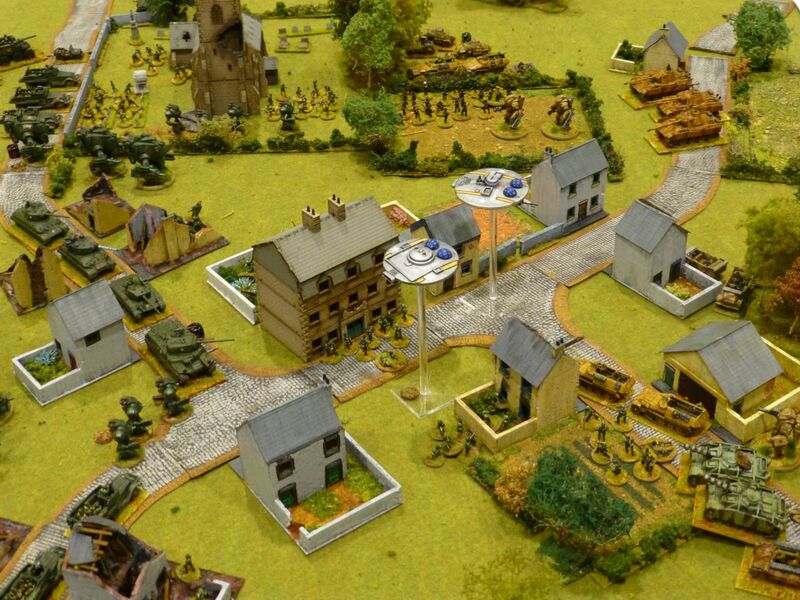 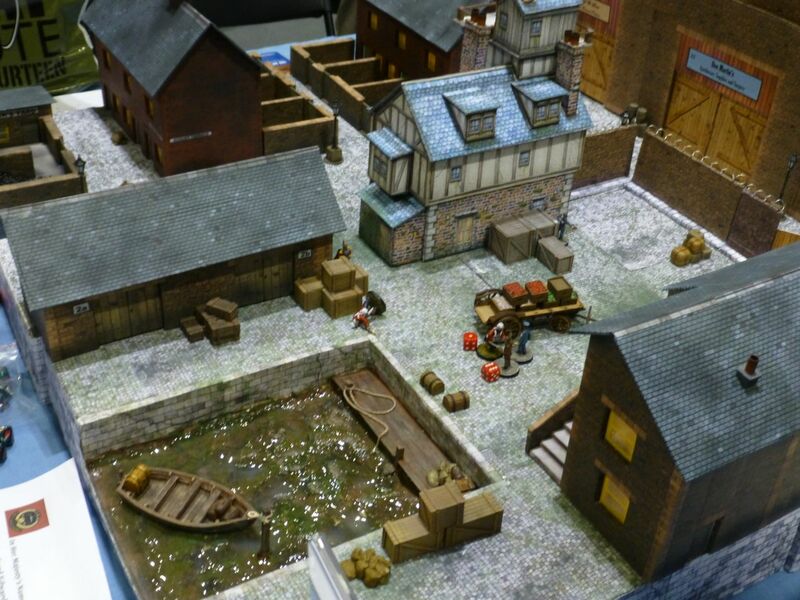 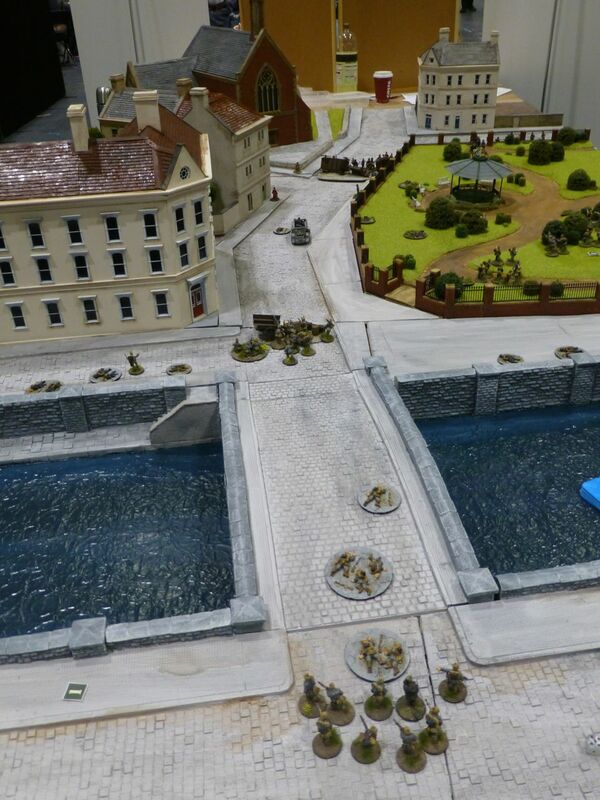 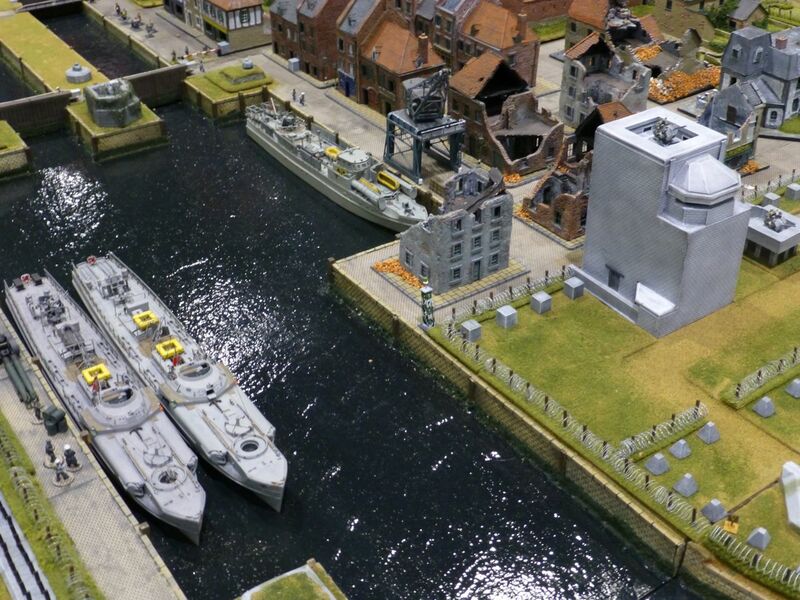 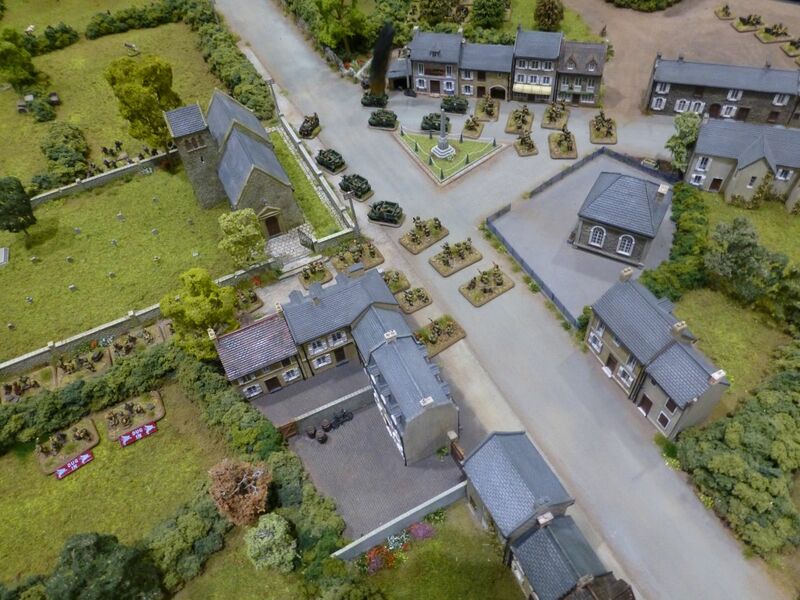 The Maidstone Wargames Society built a town Somewhere in Belgium for a clash at a bridge during the early part of the war. 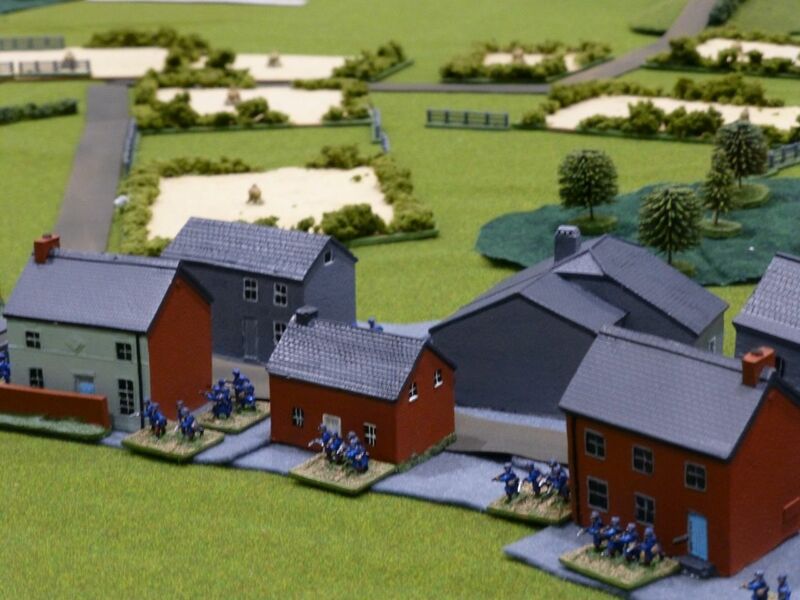 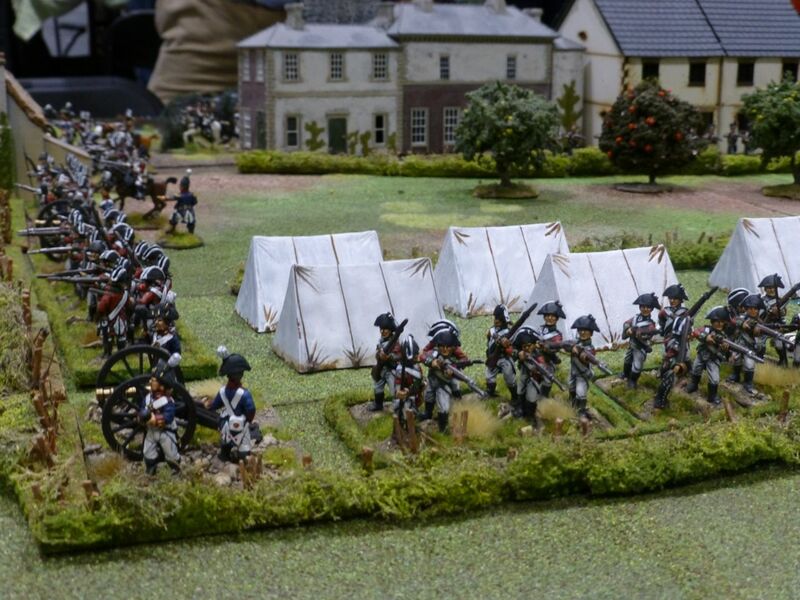 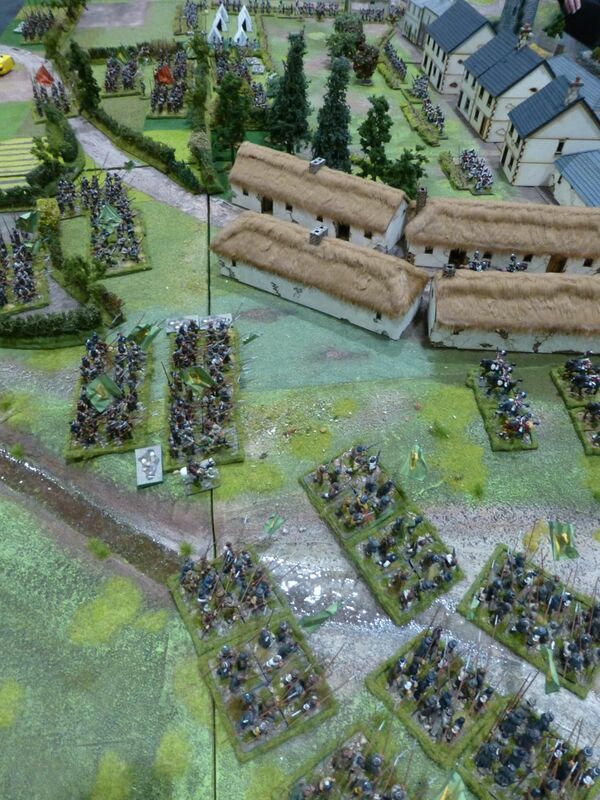 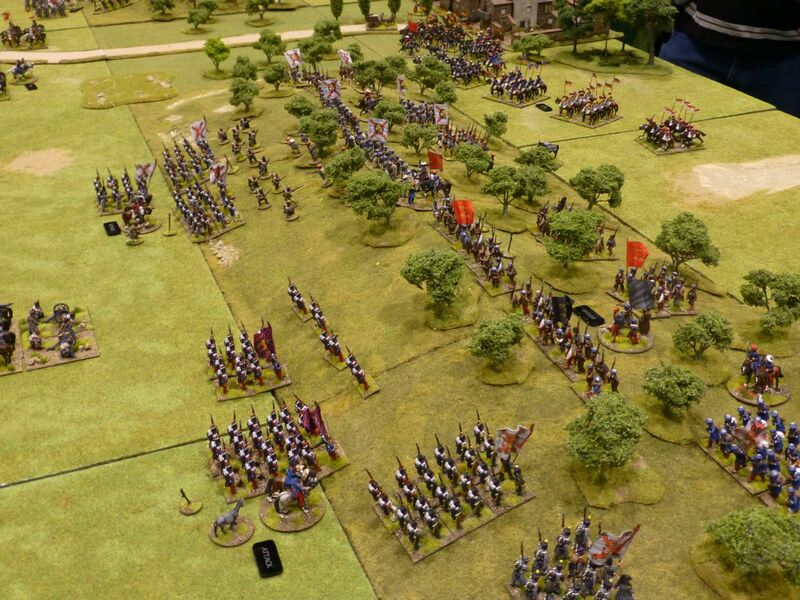 The 10mm scale Action at Longlier by Oxford Wargames Society took the fight to brigade and division level. 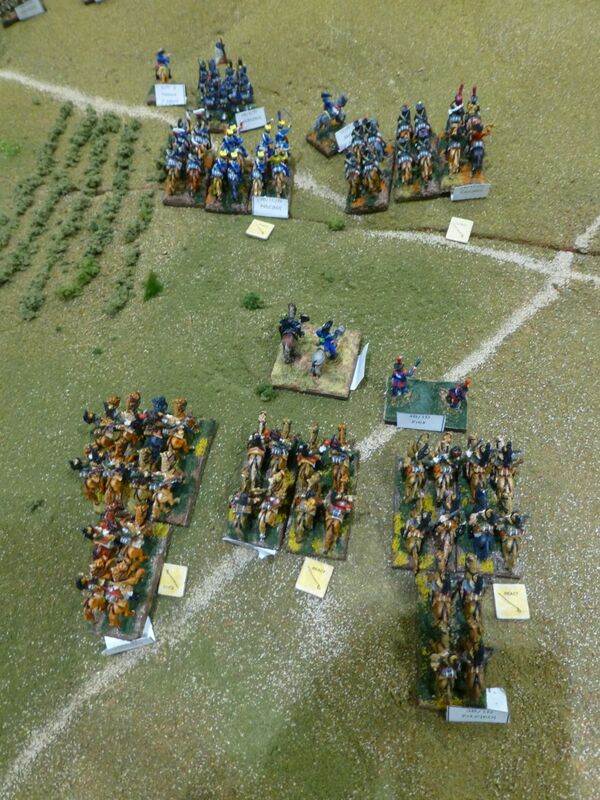 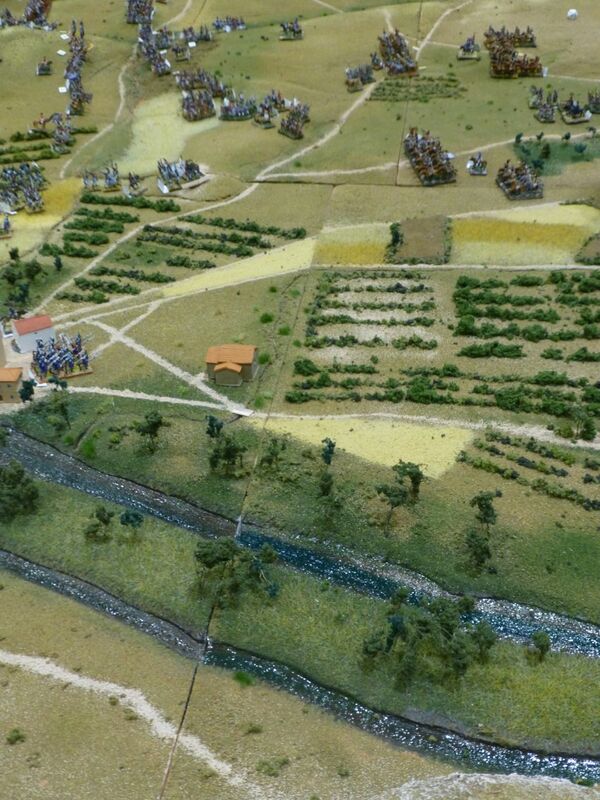 Tin Soldiers of Antwerp had brought a wonderfully detailed board for A Noble Affair. 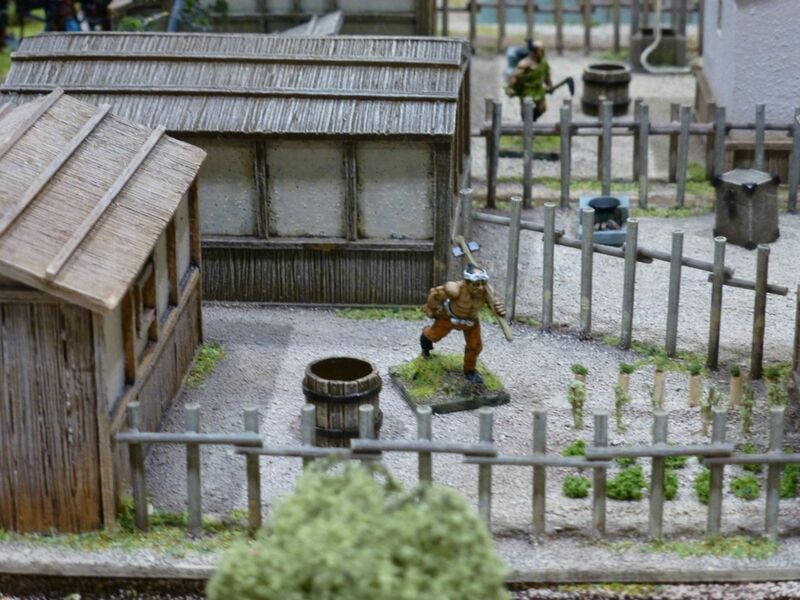 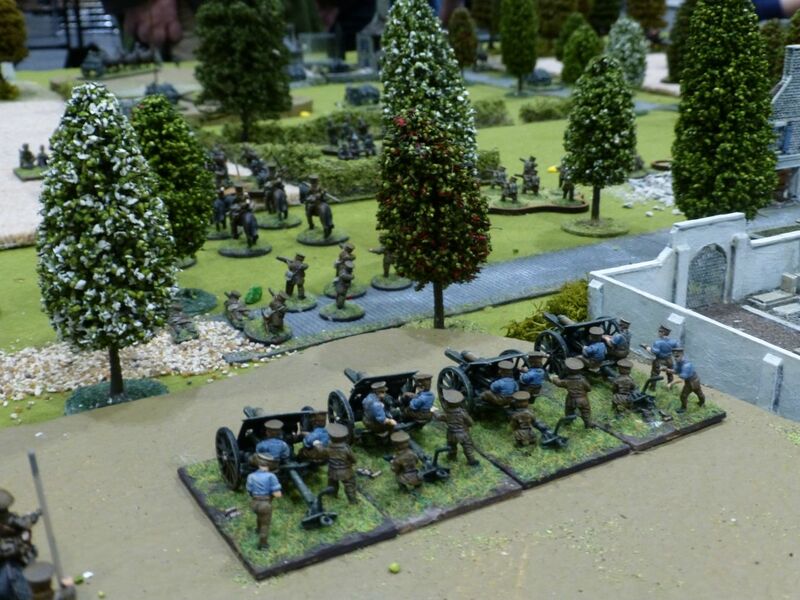 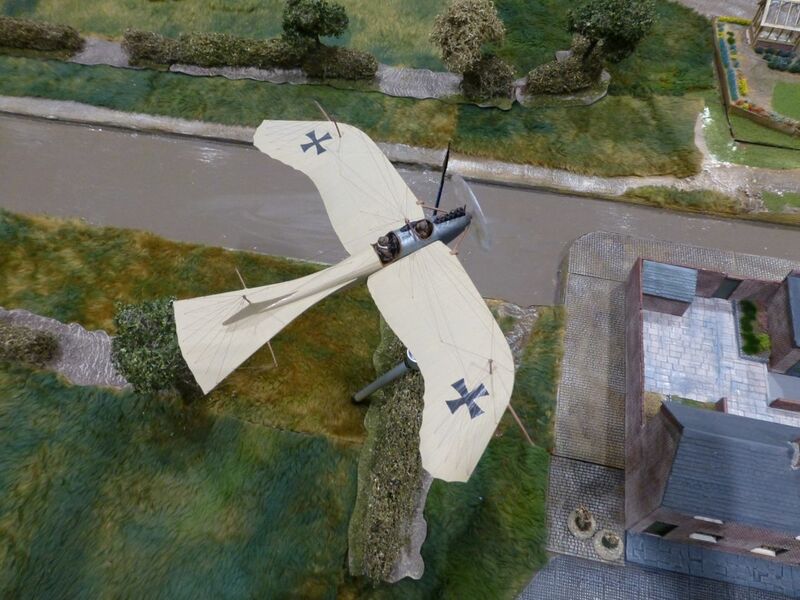 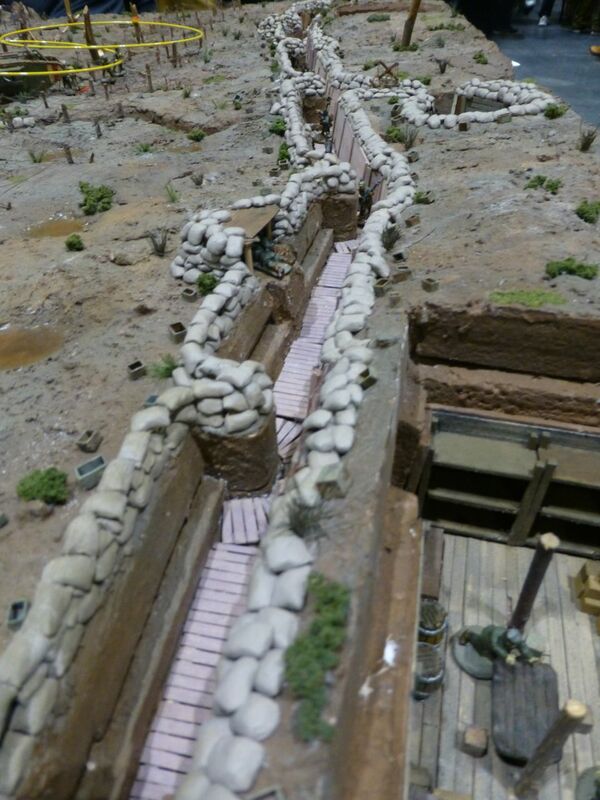 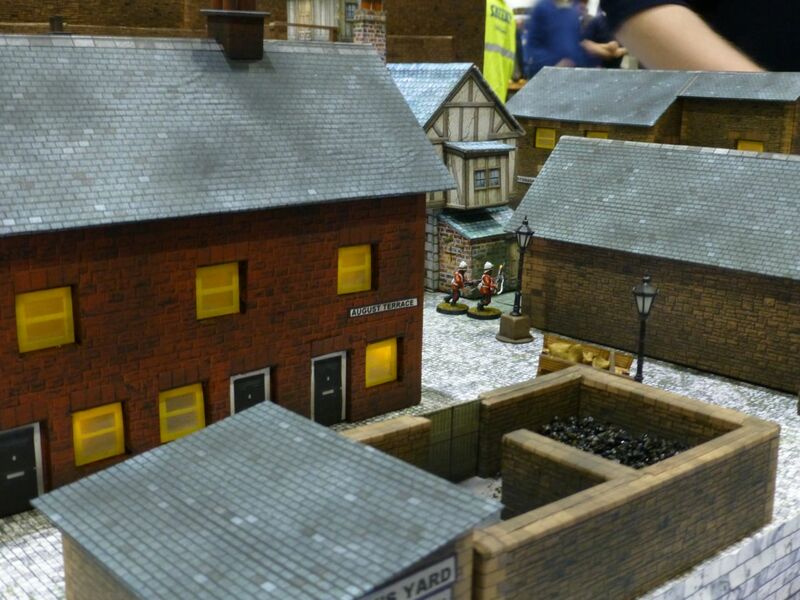 A trench raid at night was the topic for Hornchurch Wargames Club. 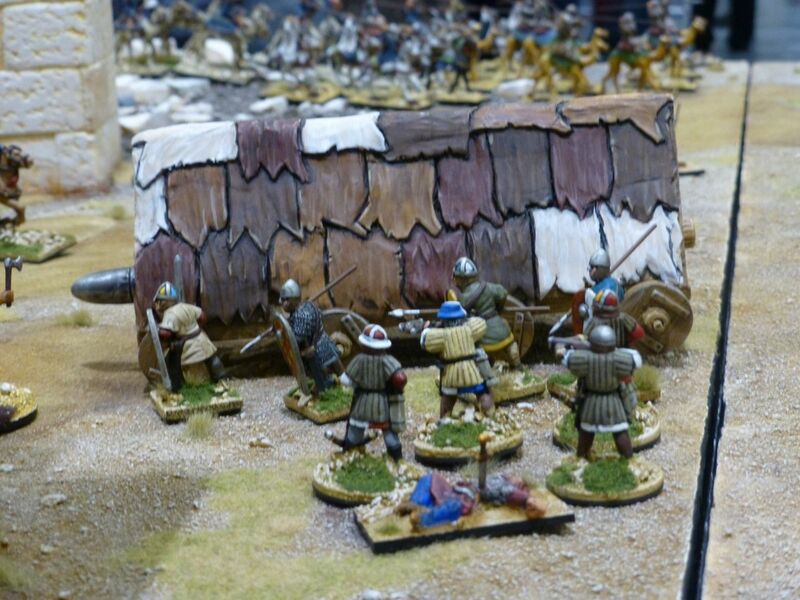 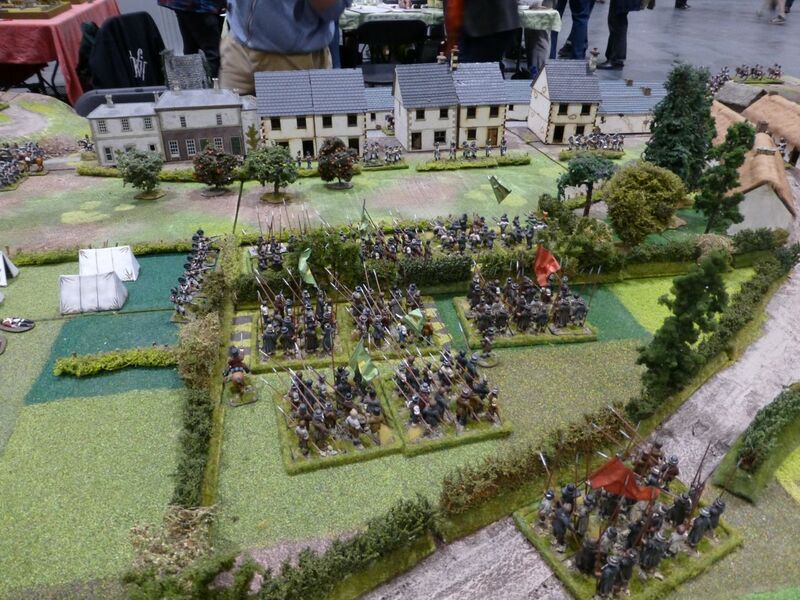 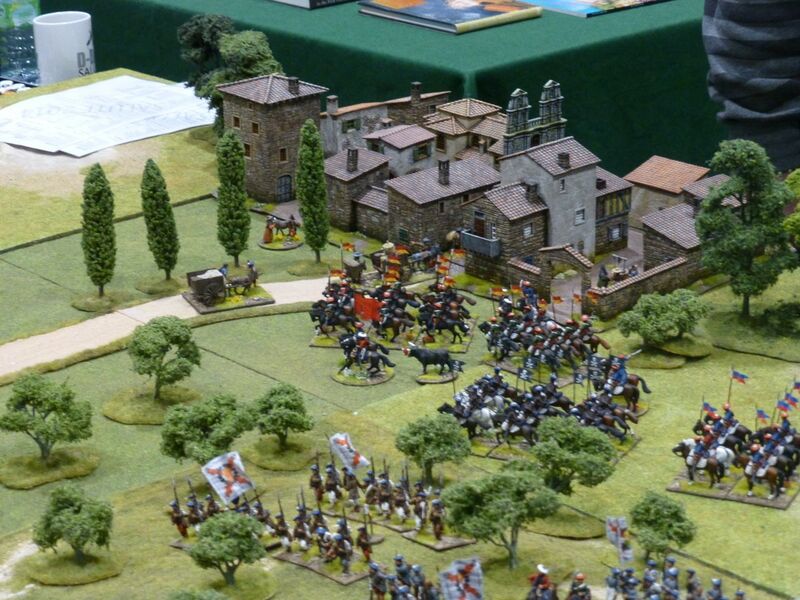 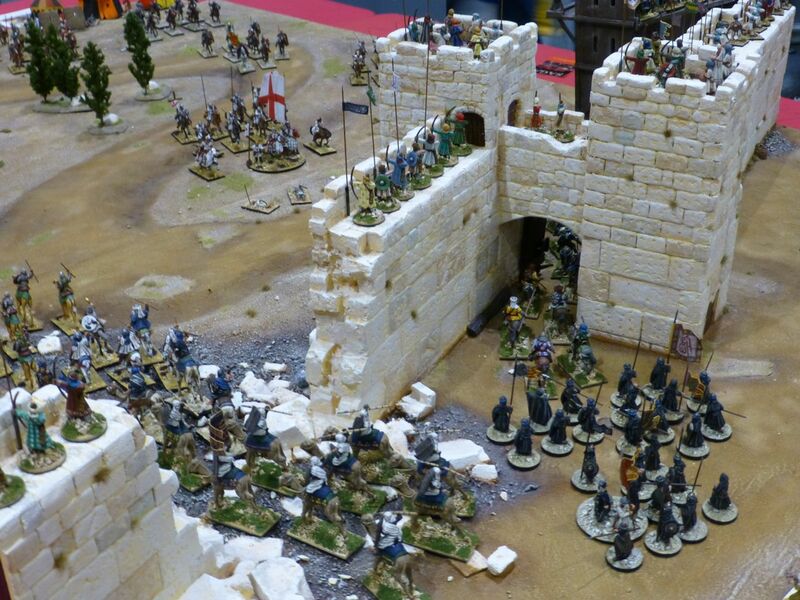 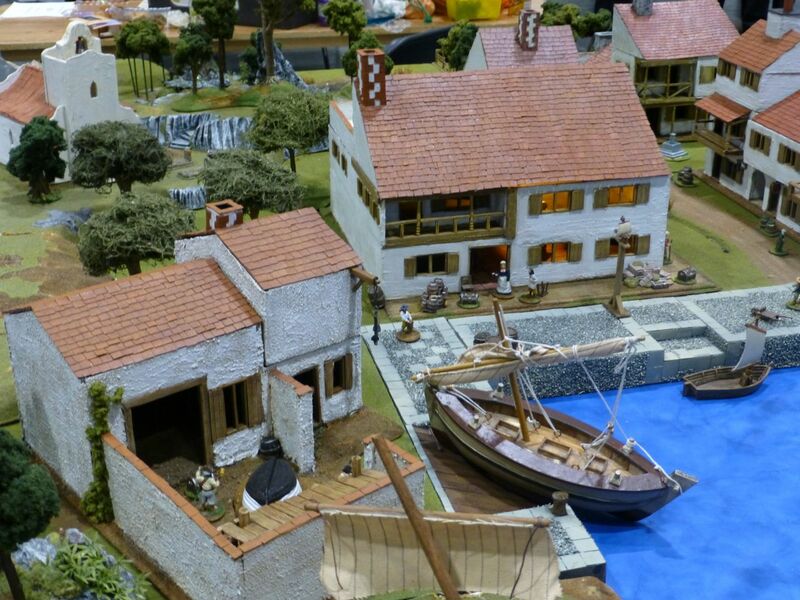 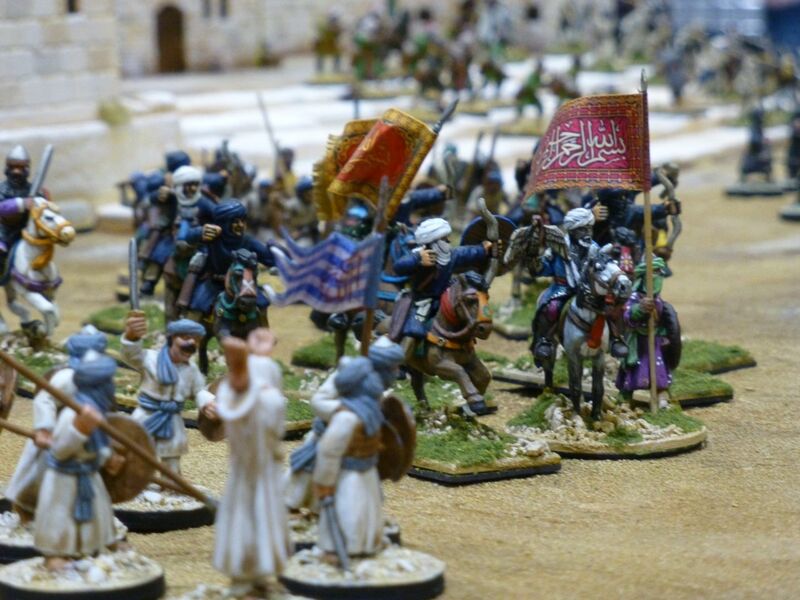 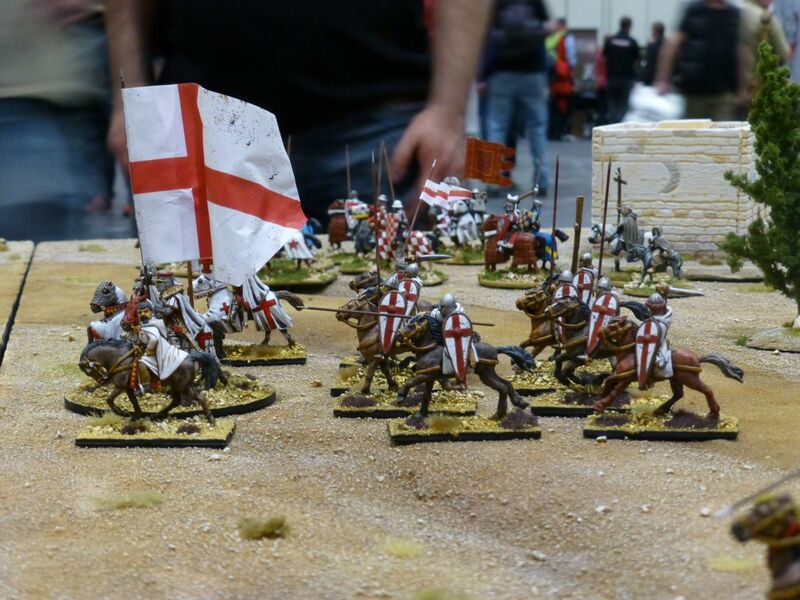 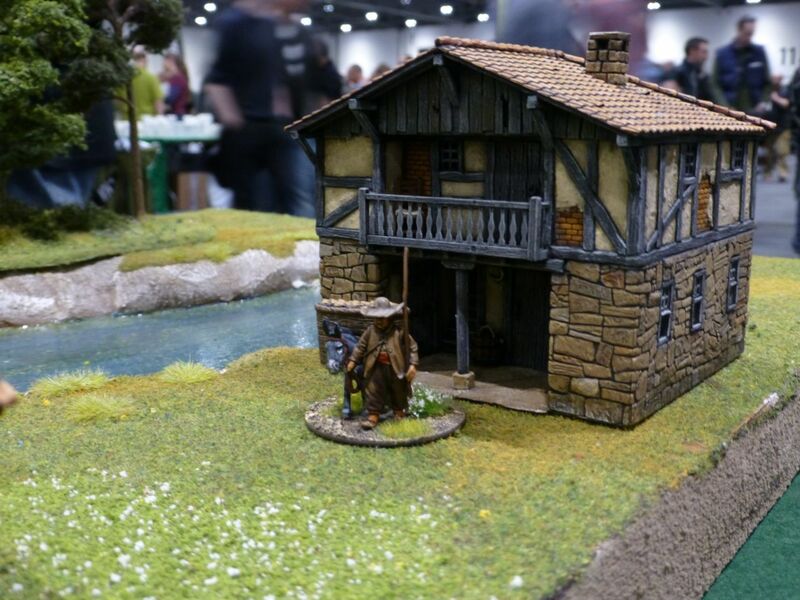 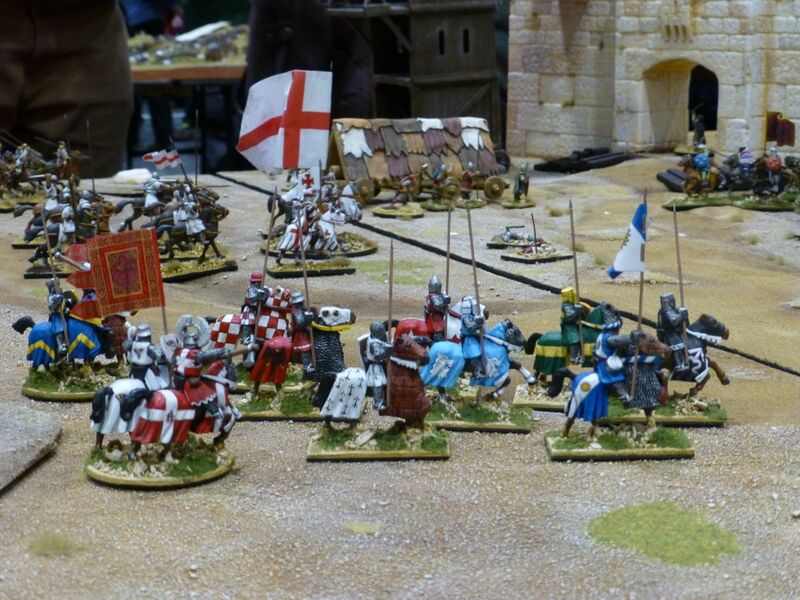 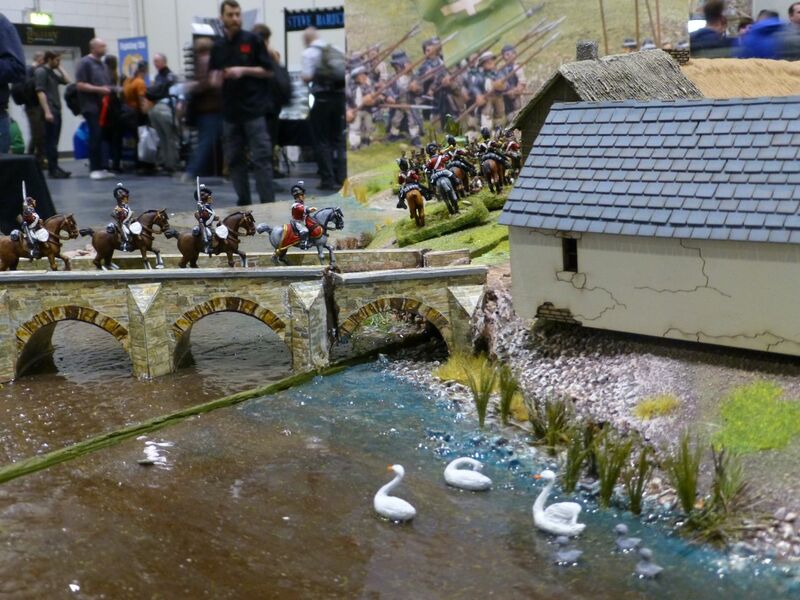 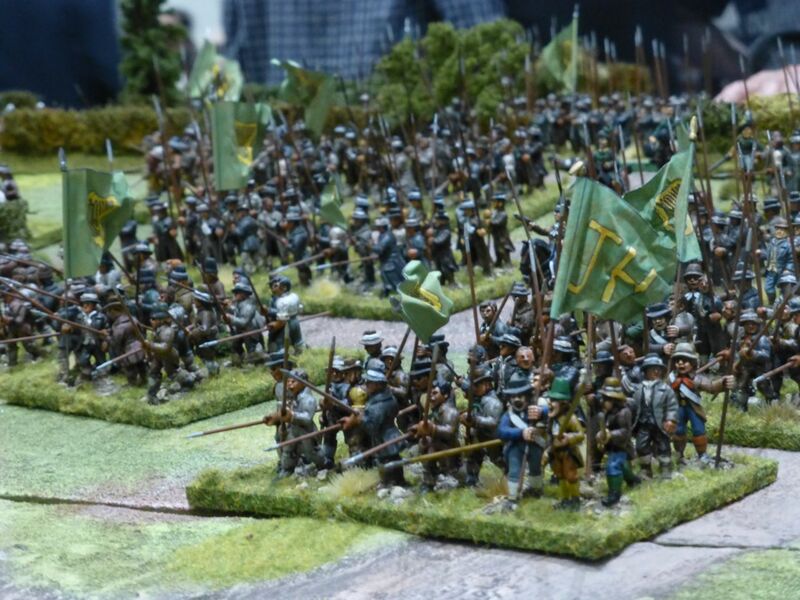 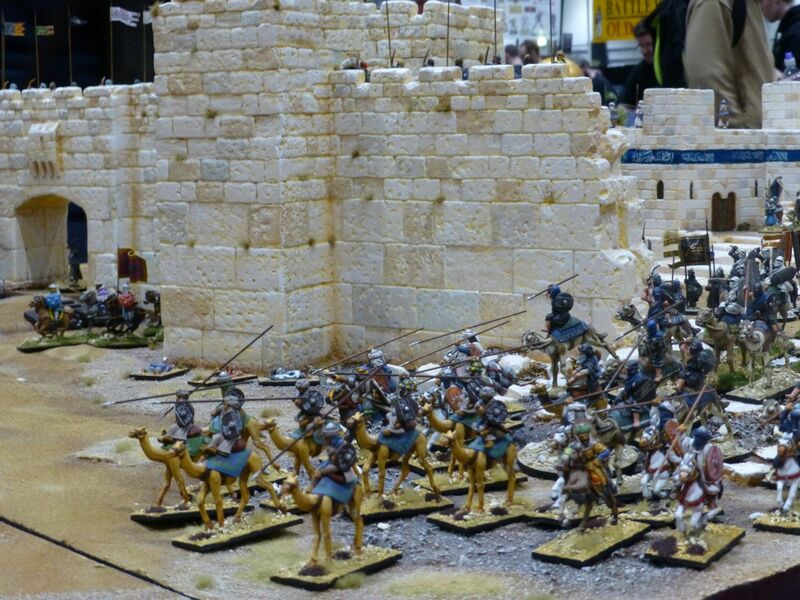 I think I missed a couple of displays and gaming boards set in the medieval era, but the one I did find turned out to be my highlight of Salute 2014. 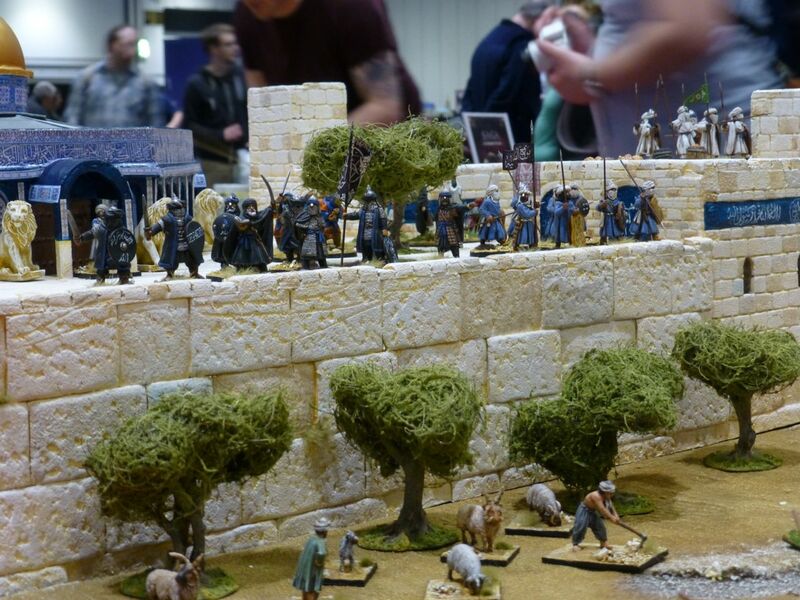 Studio Tomahawk are about to release the new SAGA: The Crescent and the Cross and were on hand to showcase the expansion with figures by Gripping Beast on a stunning board depicting an assault on a fortified city.